Card Text Action: Destroy a damaged creature. 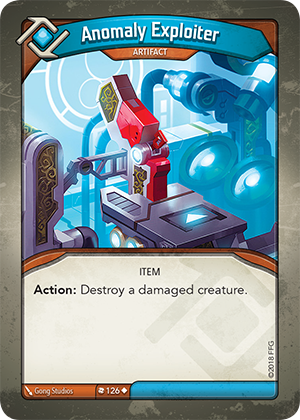 Can I use Anomaly Exploiter’s “Action:” ability even if there are no damaged creatures in play (for effects like “Each time you use an artifact, gain 1 Æmber”)? Can a friendly creature be targeted with Anomaly Exploiter’s “Action:” ability? Yes. The only limitation in the wording of this card is that the targeted creature needs to be damaged. Therefore, this ability can be used to target any damaged creature, including your own.